A Cleveland lawyer is an attorney, barred in the State of Ohio, who represents clients in criminal and civil actions in the City of Cleveland and the County of Cuyahoga, Ohio. 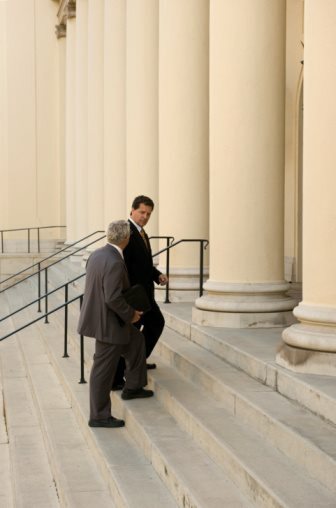 Cleveland lawyers can practice all types of litigation. Civil Cleveland lawyers practice for plaintiffs and defendants in areas including personal injury, contracts, real estate, landlord/tenant, wills and trusts, corporate law and many others. Criminal Cleveland Lawyer focus their practices primarily on defendant’s who have been accused of misdemeanors, felonies, and traffic violations. Cleveland lawyers must be barred in the State of Ohio, be in good standing and meet the disciplinary requirements of the Ohio Bar Association. In order to be a Cleveland lawyer an individual must pass the Ohio Bar Exam. The Ohio Bar Exam is a three day examination. The first day consists of 6 essay questions created by the Ohio Board of Bar Examiners plus 2 Multi-State Performance tests. The MPT is a 90 minute exam that is used to gauge an applicants ability to take facts and evidence and apply it to the law. Day 2 of the Ohio Bar Exam consists of the Multi State Bar Exam, or MBE, a nationwide multiple choice examination administered by the National Bar Association. Day 3 of the Ohio Bar Examination consists of another 6 essay questions based on Ohio law. In addition, an applicant must take the MPRE and get a passing score of 85. The passing rate for the Ohio Bar Exam is around 75%. In grading the Ohio Bar Exam the state only counts the MBE for ⅓ of the overall score on the Ohio Bar Exam. Reporting Discipline about Cleveland Lawyers? If you have had a problem with your Cleveland Lawyer, or you know of illegal or unethical actions taken by a Cleveland Lawyer, it is important that you report that matter to the Ohio Office of Disciplinary Counsel. The Ohio Office of Disciplinary Counsel will then review the complain and determine whether to file an action against the lawyer. If the Office of Disciplinary Counsel finds enough evidence that would warrant the filing of formal charges against the Cleveland Lawyer than it will forward the issue to the Ohio Board of Commissioners on Grievances and Discipline. A formal hearing by the Board of Grievances and Discipline is a public hearing and may require the complainant to testify in open court. There are no formal requirements for filing a complaint but the complaint must be written and signed by you. Include as much documentation as possible that concerns the illegal, or unethical, actions of the Cleveland lawyer. Upon receipt the disciplinary council will review the matter and inform you if any action will be moved to the Board of Commissioners on Grievances and Discipline. Why do I need a Cleveland lawyer? Depending on your case you will need a Cleveland lawyer. Courts in the Cleveland court system have their own rules of procedure that other lawyers, even in other parts of Ohio will not be aware of. Cleveland lawyers will be knowledgeable of the filing deadlines, rules comprising the format of complaints and pleadings, and the particular rules of a specific court. Where do I find a Cleveland lawyer? If you want to find Cleveland lawyers who can help you with your legal problem you can go to the Cleveland Bar Associations website at www.clemetrobar.org. At the left of the page you will see a link to the Cleveland Bar Associations lawyer referral service. The Cleveland Metropolitan Bar Association’s referral service may be contacted weekdays from 9am - 4pm at 216-676-3532. It may also be reached by filling out an online application at www.clemetrobar.org. After a brief discussion with a representative from the referral service they will give you the information of a lawyer in that are of law who practices in your location. The referral service will guarantee you, up to, a 30 minute consultation with the lawyer, for free. After that it is up to you and the lawyer to determine fee arrangements when, and if, you proceed with the representation. In addition you can seek a Cleveland lawyer referral from the laws.com website. At the top of this page you will find a link that states “find a lawyer” by clicking on that you will be prompted to enter information including your name, telephone number, e-mail address, location, and description of your legal problem. Someone from laws.com will then notify you, either over the phone or through e-mail and give you referral advise on what Cleveland lawyers in your area may be able to help you with your legal problem. What if I can’t afford a Cleveland lawyer? If you are in need of Cleveland lawyers but you cannot afford representation then you may require the help of legal aide services in Cleveland. Cleveland lawyers are required to volunteer a number of hours per year for pro bono services. You can look for resources for free legal aid through the Cleveland Community Legal Aid service at 216-687-1900. In order to take advantage of legal aide services an individual must have income below 125% of the national poverty level. What questions should I ask a Cleveland Lawyer? ■	Are you barred in the state of Cleveland? ■	How long have you been practicing in Cleveland?